This may be our new go-to for a summer meal. I love grilling, don’t get me wrong, but something about ratatouille is deeply satisfying; a warm celebration of the amazing produce that is finally available. 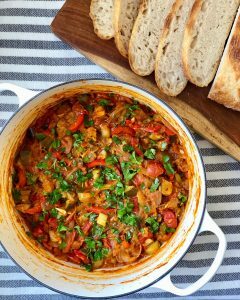 And though it isn’t yet warm enough for garden-fresh vegetables here, our quick and easy variation on ratatouille provides enough flavor that you can use whatever vegetables are available to you year round. We used sweet onions, eggplants (peeled and chopped for quicker cooking), zucchini, red bell peppers and cherry tomatoes. The cherry tomatoes are actually quite sweet lately, but feel free to use whatever variety is tasting the best. And if you want to make this in the dead of winter? A canned tomato like San Marzano works perfectly. An ample helping of fresh garlic give tons of flavor and herbs de Provence gives this dish its signature French feel. 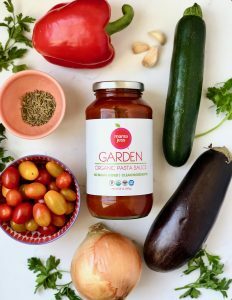 The real time saver is a bit of our Garden Pasta Sauce; it has the depth of flavor this dish needs so it tastes as if you’ve been cooking all day. The best part about this dish? It gets better the next day. Which means you can serve it the first day atop grilled fish and the next day with a runny egg and a giant piece of crusty bread, and it doesn’t even feel like leftovers. If you make this or any other dish in our #LastMinuteMeals series, let us know! 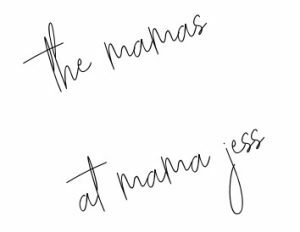 We’re on Instagram at @mamajessfounder and Facebook too. Peel and halve the onion, then slice thinly. Chop all the vegetables to roughly the same size so they cook evenly; about 1 inch pieces. Feel free to leave the tomatoes whole. Add 3 T olive oil to the pan and heat. Add the onions and bell peppers first, season with a pinch of salt and 1 tsp of the herbs de Provence. Cook for about 6 minutes, stirring frequently. When the onions and peppers have softened, add the zucchini, eggplant and tomatoes and season again with a pinch of salt and the last teaspoon of herbs de Provence. Cook for 6 minutes more, stirring frequently. Chop the garlic and add it to the pot, stirring and cooking for another minute. Add MJ sauce and cook everything for 7 minutes, uncovered, stirring gently but frequently. Top with parsley or basil and the remaining T of olive oil, and a sprinkle of coarse salt.